There's a little hill a few blocks southwest of downtown Leesburg, located on what's left of a farm - a GREAT SLEDDING HILL! 1-Sled at your own risk. 2-Small children must be attended. 4-A wood fire only. Do not burn tires." 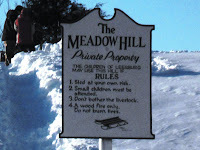 The rules seemed reasonable to me... so my kids, my neighbors and I greatly enjoy free use of this hill. The hill is surrounded by townhomes, and a few small single family homes with very little yard of their own. None of those homes have any space of their own to sled, so the hill offers a special kind of wintertime fun to the neighborhood children. Although my home is on the opposite side of the farm, and we "could" sled in our our yard, this is way more fun. There are more friends to play with, and the snow is well packed by the time we get there, which makes sledding awesome! The younger children enjoy the sledding. The older kids tell mom and dad they are watching their baby brothers and sisters....but they are really there to flirt. Younger siblings don't much like this, and I have witnessed more than a few snowball fights as a result. My family missed the bonfire "they" had the other night (I don't even know who "they" are, since it seems permission to burn a fire is granted widely). Although I am not sure if burning an open fire inside the Town of Leesburg is legal, I'd have risked it; and I bet we would have had a great deal of fun. Hopefully, we'll catch the next one. It's become a wonderful addition to our community ammenities! Snow Day Camps in Ashburn @ Jumping Jack Sports! Note: The personalized report will be automatically emailed to you within minutes of your request. Search for Homes For Sale and More!